Insulation for Refrigeration Systems - Industrial Refrigerated Systems Ltd.
Posted on Mar 21st | Written by Industrial Refrigerated Systems Ltd. 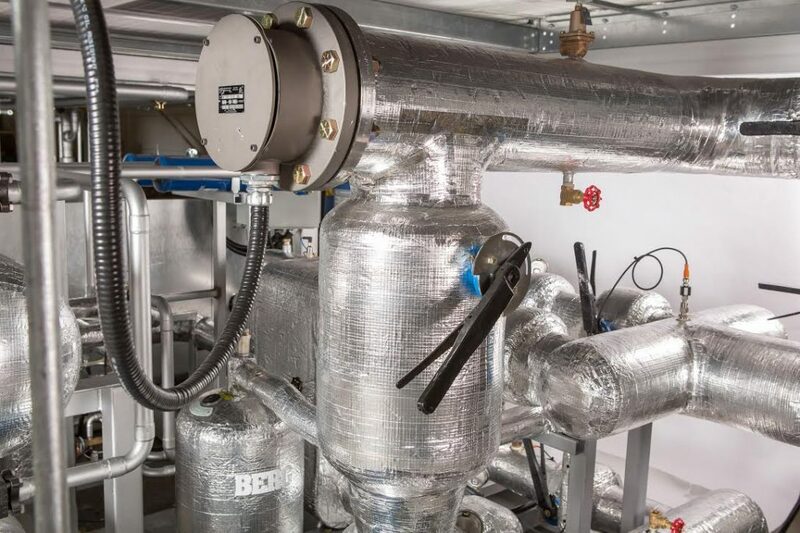 Insulation performs a vital role in limiting heat gains in an industrial refrigeration system, ensuring that the compressor load does not become excessive. It can typically be found on piping between the evaporator, the compressor, accompanying vessels and auxiliary equipment. Insulation is also used to conserve energy, prevent condensation or ice formation and minimize corrosion. Conduction: heat transfer through direct thermal contact between a hotter and colder material. Convection: heat transfer through natural or forced circulation of a fluid. Radiation: heat transfer through the exchange of infrared energy naturally given off by every object. When choosing insulation for a refrigeration system thermal and mechanical factors, as well as process control issues are considered. Insulation that is used in industrial refrigeration must be suitable at both the minimum and maximum operating temperature ranges of the system. This means that the insulation material should have low thermal conductivity and low water vapor permeability. There should be sufficient insulation to maintain 8 – 10 BTU/ HR heat gain per square foot of pipe surface. * Polyisocyanurate (PIR) and Polyurethane (PU) are frequently used interchangeably. This is because the two products are made up of the same raw materials but made using different ratios. Due to the location of insulation on the chilling system regular maintenance and inspection is crucial in keeping your industrial refrigeration system running at peak performance. Any damage to the insulation could mean that the mechanical integrity of the piping is in corroded or compromised. Depending on what kind of refrigerant used, it could lead to the risk of ammonia leaks. Some people mistakenly think corrosion is caused by the insulation, this is not the case. Corrosion occurs under the insulation due to moisture build up, aerated water or water borne corrosive material. The corrosion of pipes can happen as a result of improper vapor retarder selection, installation, maintenance or mechanical abuse of voids in the insulation system that retain water. Corrosion problems can also occur when equipment is operating steadily or cyclically at or above freezing or on pipe legs protruding into ambient temperature areas. The risk of corrosion can be minimized by making visual inspections of insulation and high-risk areas a regular part of your chilling system maintenance. If the insulation appears to be damp or damaged it should be replaced straightaway to avoid corrosion. If you are unsure whether the insulation on your chilling system is damaged or in need of replacement it might be a good idea to have it professionally inspected. Our experienced personnel can identify potential risks and determine the appropriate level of inspection and repair needed for your chilling system. What Makes Insulation Systems Work Successfully in a Refrigeration System? At Industrial Refrigeration Services Ltd. we can supply quality insulation for your chilling system or provide a professional design and installation that meets your refrigeration system needs. Contact Industrial Refrigerated Systems today!